Note: This review does contain spoilers. If you don’t want to know about the plot or twists, please skip to the features, audio and/or video sections. Those are spoiler-free. The tagline, “Yipee Ki-Yay, Mother Russia”, was such a bad omen… Well, that and even the trailers couldn’t make A Good Day to Die Hard look good. Perhaps the title should’ve been A Good Day to Let the Franchise Die… Hard. Our story opens in Moscow where corrupt Russian politician Viktor Chagarin (SERGEI KOLESNIKOV) meets a former friend and partner, Yuri Komarov (SEBASTIAN KOCH), who is in prison awaiting trial. See, Komarov is apparently in possession of evidence that could bring Chagarin down, thus he will do anything to get the evidence. Separately we meet Jack McClane (JAI COURTNEY) who has been arrested for assassinating a mobster. He tells prosecutors he has information that will convict Komarov at his trial in exchange for a shorter sentence. I did mention this was a Die Hard movie, yes? 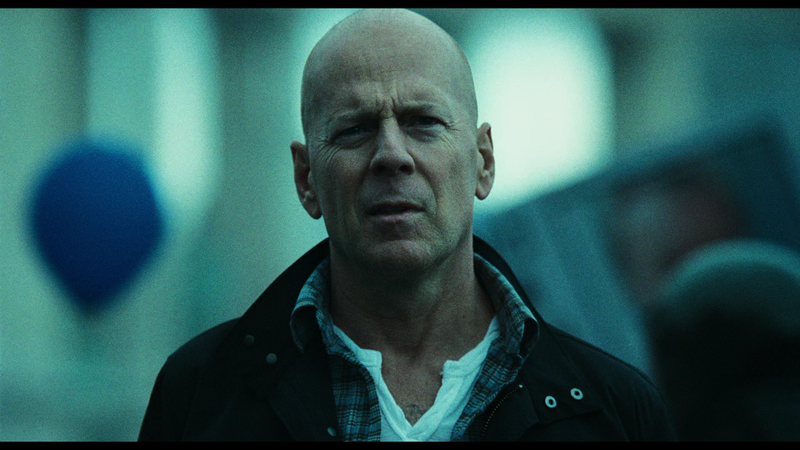 So we finally get re-introduced to our hero, John McClane (BRUCE WILLIS), who is trying to reconnect with his son whom he had not spoken to in years. 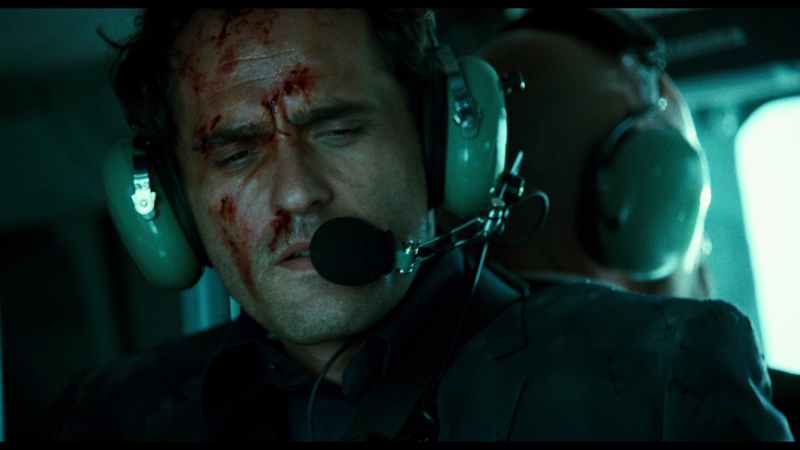 Through a friend, he receives the file on his imprisoned son and decides to take a trip to Moscow to attend the trial. After a painfully unfunny exchange with a taxi driver, John, henceforth known as “McClane 1.0” arrives at the courthouse just as he sees his son, known as “McClane 2.0” for now on, alongside Komarov, enter the courthouse. Inside, McClane 2.0 and Komarov are locked in cages but before the proceedings can begin, the courthouse goes under attack where, of course, McClane 1.0 springs into action. McClane 2.0 and Komarov are freed and escape into the streets where upon we discover McClane 2.0 is working for the CIA to extract Komarov and get those secret papers. McClane 1.0 however is unaware of this when he and his son finally come face to face as McClane 2.0 is about to get away and ahead of the force on their tale. 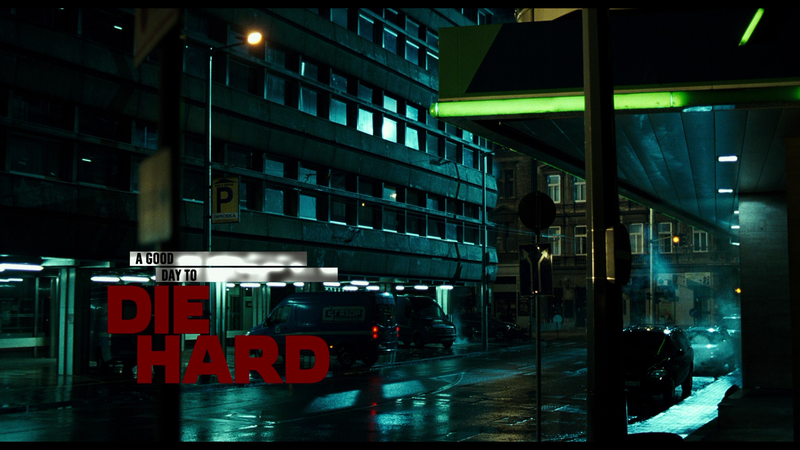 After a nifty car chase involving McClane 2.0, McClane 1.0 and Chagarin’s men headed up by yet ANOTHER villain, a henchman I realize, in Alik (RADIVOJE BUKVIC), the chase that began on a positive note soon turns into a monster rally after McClane 1.0 gets behind and must, ugh, go over cars in his SUV to close in with the others. Before this scene the movie was going OK, nothing great and obviously other than the character name nothing lending itself to being a Die Hard movie, but it soon was looking like a big budget Jean-Claude Van Damm or Wesley Snipes direct-to-video flick than anything else. I could recap the plot further, but what’s the point? It’s just more snide remarks, so all I’ll say is, it’s a jumbled mess going from one expensive action set piece to the next. Yeah, there are some twists that aren’t too surprising especially when the film’s focus on an antagonist continued to change with each act. The film does have a cute femme fatale in Irina played by Russian-born actress Yuliya Snigir as a fun psycho who was minimalized but when I enjoyed seeing her more than McClane 1.0, you know the film is in trouble. A Good Day to Die Hard was helmed by John Moore whose filmmaking, from my reading, was greatly inspired by the first Die Hard movie. So it’s a bit perplexing how, despite having a great influence, this was the least looking Die Hard movie to date… and that’s saying a lot when you consider Live Free or Die Hard. The problem is, and this began probably going back to Die Hard with a Vengeance, they’ve turned John McClane from an action hero into a superhero, defying gravity, able to leap off tall buildings in a single bound. It’s ridiculous beyond measure where this franchise has gone. It should also be noted the film was written by Skip Woods who had a stretch of high profile movies including Hitman, X-Men Origins: Wolverine, The A-Team and the upcoming David Ayer thriller, Sabotage which followed his breakthrough, albeit box office disappointment, Swordfish. The acting also isn’t anything spectacular, although I suppose this franchise has never been known for quality performances save for the first entry headed by Bruce Willis and Alan Rickman who made for the best hero/villain team in history IMO. But since then, and especially noticeable in A Good Day, most of these actors were sleepwalking through their roles or perhaps bored acting against a green screen. 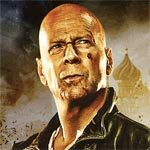 Willis himself doesn’t even resemble John McClane and instead his usual old self I’ve seen numerous times in many crappy direct-to-video releases. Overall, A Good Day to Die Hard isn’t just the tired worst of the Die Hard franchise but one of the worst movies of 2013. The action is dumb but not in a fun way (see Fast & Furious 6) and even Bruce Willis is a shell of his former self playing every role from the past 5 years with lame one-liners and failed catchphrases. This release comes with a glossy slip cover. Inside is a standard DVD Copy and a download code for UltraViolet. Extended Cut (1:41:11; HD) – My initial viewing was the theatrical version but in sampling this cut, the biggest difference, other than an additional 3-minutes, is the removal of Mary Elizabeth Winstead’s cameo appearance. Audio Commentary – Director John Moore and First A.D. Catone discuss the extended cut of the film providing some on-set anecdotes, working with Bruce Willis and other tid-bits. For those wanting to know the differences, Moore does tell a few the differences between the theatrical and extended versions. Deleted Scenes (14:28; HD) – Despite there being an “extended cut”, there are still eight scenes that remained on the cutting room floor. In fairness, these only managed to bog down the film and turned Die Hard into a Bourne rip-off even more. Anatomy of a Car Chase (26:12; HD) breaks down the big car chase sequence and how it was all put together. Two of a Kind (8:00; HD) – This featurette looks at father/son team-up and casting Jai Courtney for the role of Jack McClane. 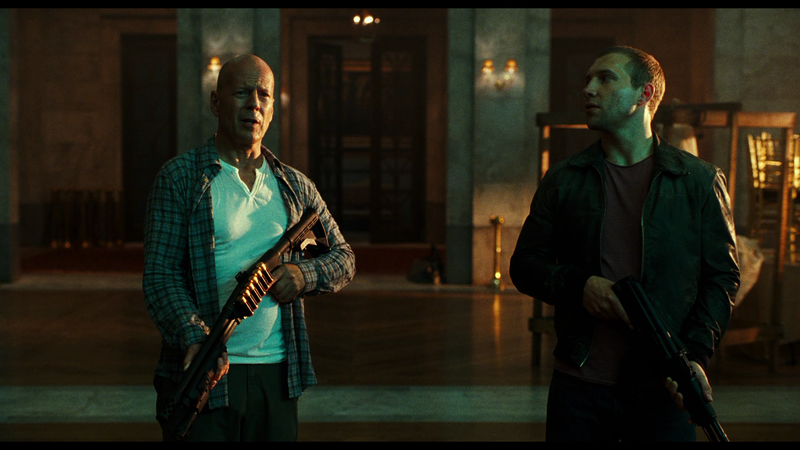 Back in Action (7:06; HD) focuses on the return of Bruce Willis in his signature role. The New Face of Evil (6:57; HD) looks at the villains/antagonists in the film. Pre-Vis (11:36; HD) – Here we get to look at some pre-visualization sequences of three scenes which never made it into the film (the last was the chase sequence which looks different). Finally we get VFX Sequences (5:35; HD) on 16 key scenes, some Storyboards, Concept Art Gallery, two Theatrical Trailers (3:30; HD) and Maximum McClane (3:16; HD) which shows footage from the previous Die Hard movies. 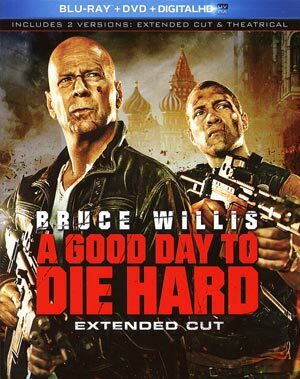 Fox releases A Good Day to Die Hard onto Blu-ray presented in its original theatrical 1.85 widescreen aspect ratio, a first for the series, and in 1080p high-def. The transfer looks, in a word, incredible. The picture has a warm look to it, a fair amount of natural film noise, the color array seems to be even keeled and the detail levels are fantastic. This is a flawless transfer, so it’s a shame the movie quality couldn’t match it. Similarly, the 7.1 DTS-HD Master Audio track is expansive as one would expect. The dialogue levels are crisp and clear and, obviously, the action scenes really come to life with great dynamics as one would expect. 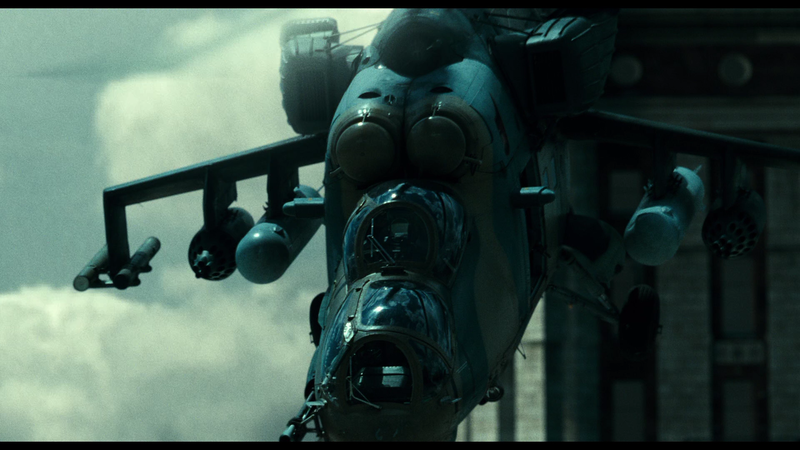 The final scene at the end, of course, especially sounds incredible with explosions galore. I would venture to say this was reference material. Overall, A Good Day to Die Hard is an all around poor excuse of an action movie. Yes, some movies can rely loud explosions and insane action set pieces but those other films were not culled from the Die Hard name. The Fast and Furious franchise can get away with it because frankly, and no disrespect, they’ve never had the most clever or intense storylines and even characters. But it is a sad day, and an argument for retirement, when Fast & Furious 6 manages to make more on its opening weekend than AGDTDH did in its entire run. The Blu-ray at least is top notch even if the movie was not. The audio and video transfers are spectacular and the features are well done and fairly expansive, more so than I’ve seen in many other releases in the past couple of years. If you enjoyed the movie or the franchise as a whole, then maybe it’s worth picking up on the cheap (or rent it), otherwise I would just skip it.